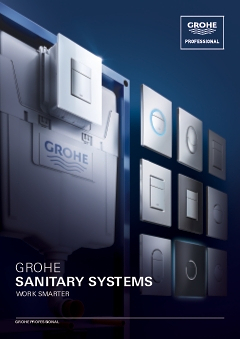 The GROHE visual DNA enables consumers to recognize GROHE quality at a glance. Central to this is the use of lozenge shapes, which can be found across several of our ranges. On Arena Cosmopolitan the soft, user-friendly appeal of the lozenge is used to form the actuation buttons. Available in GROHE StarLight® chrome, matt chrome and white, the design complements a number of our brassware collections and also includes a model for urinals.